Last week at WPC, Microsoft’s COO Kevin Turner talked about the Enterprise Mobility Suite in his Achieving More Together presentation (48 minute mark) which was launched a few months ago. I have had the opportunity to demonstrate the suite to several partners since it was launched and the response has been very positive. EMS combines 3 existing services into a unified management solution: Intune for Mobile Device Management, Azure Rights Management, and Azure Active Directory Premium. 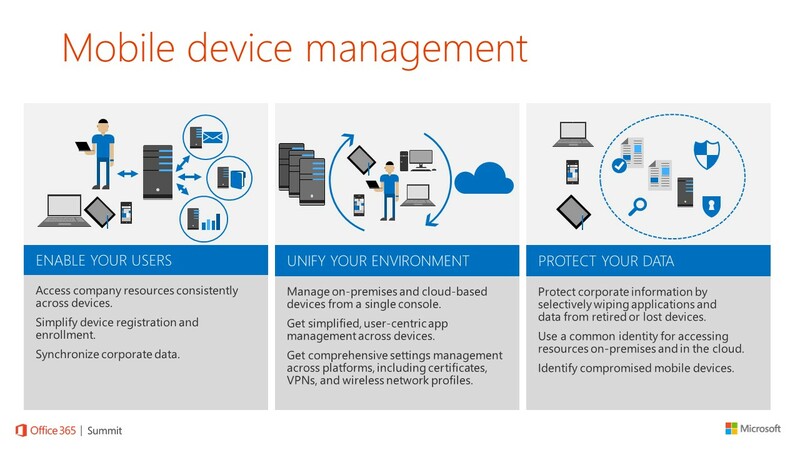 Microsoft Intune allows you to control both domain and non-domain joined devices. This includes laptops, phones, and tablets. Before you ask, Intune supports both Android and IOS devices. You can push out applications and links, synchronize corporate data, and selectively wipe the device. 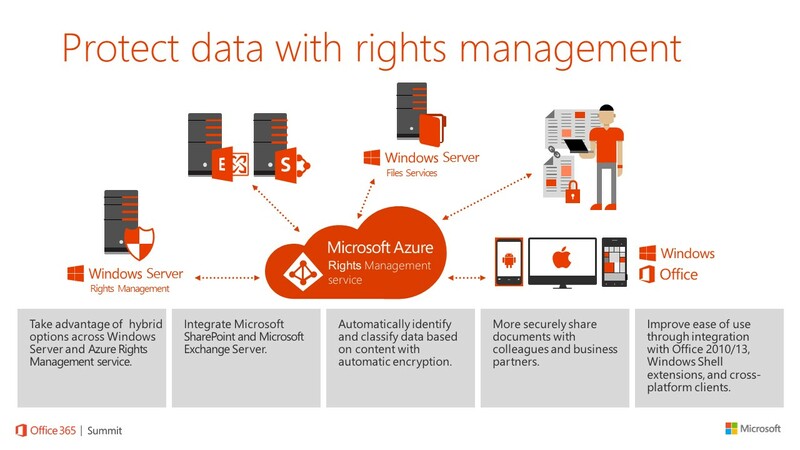 Azure Rights Management protects and controls the flow of information for Office 365, SharePoint Online, OneDrive, and your on-premise directories as well. For example, if I had a document that had a SIN number in it, I could prevent that document from being sent to an external email address. 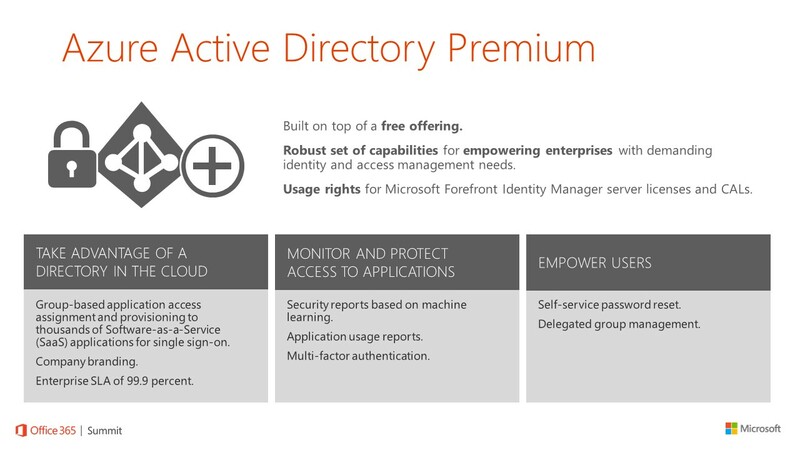 Azure Active Directory Premium (which, in my opinion, rocks!) provides single sign-on to thousands of SaaS applications, multifactor authentication, and rich reporting. Here is an example of the SaaS services I can access via my Azure portal. With a single click I can access any of these services without knowing the corporate credentials. I am not going to go into detail for each service; links are provided for more details. 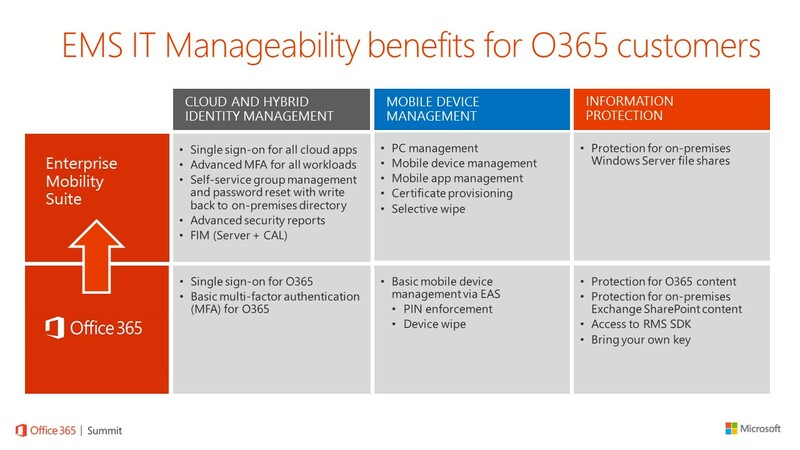 In short, EMS puts Office 365 on steroids. We all want the control we have with Server Active Directory, and EMS gets us pretty close. Using EMS provides control over your users, data, and devices. If you have not had the opportunity to look at the EMS offering, I would highly recommend you do so. Mattamy Homes shares their EMS experiences in this customer story. If you would like more information on how EMS can help you manage your customers, please reach out to a Microsoft Partner and stay tuned for upcoming in-person sessions.